Last week was full of school runs in the car, (which I'm not yet used to) errands and housework and late afternoon trips to supermarkets and shopping complexes trying to get everything together for Christmas. Our holiday always starts when Hubby B finishes work and does the big Christmas food shop so I'm trying to be super organised and get prepared for that. Last Thursday via social media, I told you I went into Cardiff for the first time on my own to start (and intending to finish) our Christmas shopping. 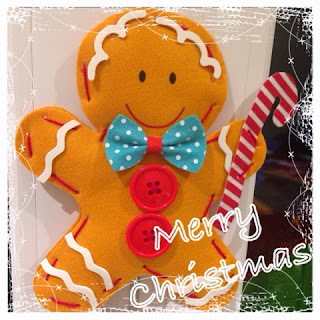 Whilst in the Early Learning Centre I saw a little kit to make a felt gingerbread man. Baby B is a little bit besotted by gingerbread men so I thought it would be a lovely afternoon activity at the weekend and would be a welcome addition to our Christmas decor, which I am ashamed to admit, is looking a bit bare! So on Sunday afternoon, we snuggled on the sofa and got to work! The layers were already fused together with the stuffing in the middle so I threaded up the needle, sewed on the buttons (that was a bit fiddly for Baby B who is 3) and showed Baby B how to sew it up. He soon got to grips and loved it. Great for fine motor skills! The white squiggly bits (technical term) and the bow tie had little sticky patches on them already so we just peeled of the paper and stuck them on! No mess and no fuss. It was really very easy and convenient and kept his attention for a good 30 minutes. Baby B loved the results of his crafty session and 'biscuit' as he is now called in sitting on top of our patio door handles so that Baby B can reach him and Littlest B can't. Bet you can't guess who chose that place! I will most certainly be keeping an eye out for more kits like this. Thanks ELC. *This was not a sponsored post. We just really liked creating 'Biscuit' so easily! was not a sponsored post. We just really liked creating 'Biscuit' so easily!